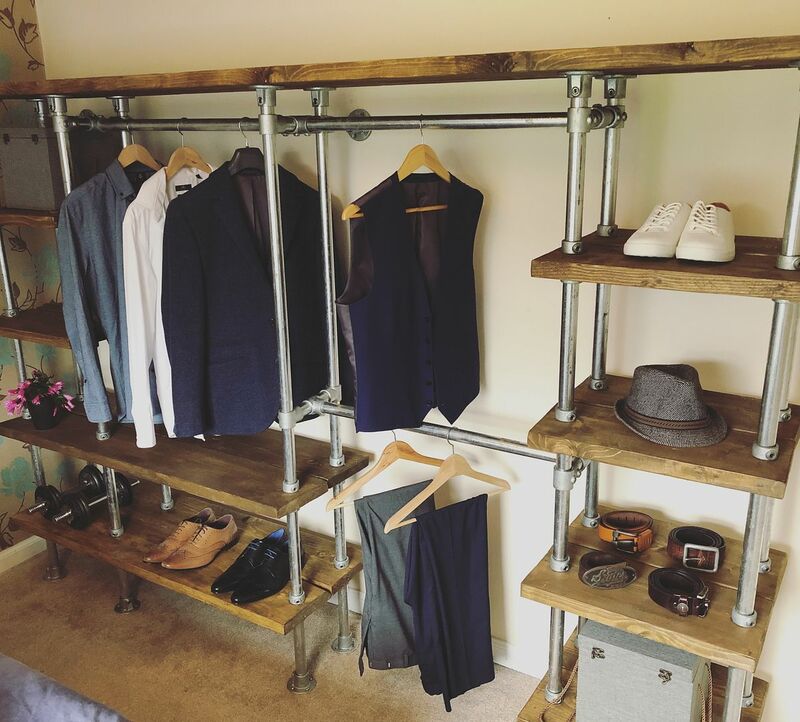 Industrial style furniture is increasing in popularity and in this blog we showcase our most recent example where chunky stained timber boards are combined with industrial style metal tubing and clamps to create a wonderful bespoke open wardrobe system for a private client in Sheffield, Yorkshire. This is flat pack furniture with a difference- the difference being it’s not flimsy rubbish that will fall to bits when you hang 3 coats from it……. This recent example was designed and supplied to our client Robert in Sheffield for DIY self-installation. The wardrobe system was fully designed around his needs and made to comprise 3no. hanging rails and numerous shelving units. The wardrobe system consists of industrial style scaffold boards, all cut to size, drilled, stained with a dark oak finish and then assembled together with a series of tube-clamp style fittings and pipework. The open-design wardrobe unit can be used to store any number of heavy coats due to its robust and sturdy construction and looks the part in either a modern or traditional setting. Robert was so delighted with the finished product, we are now working to design and manufacture a matching bed frame and chest of drawers to complete his bedroom. “Guys, I am so pleased with the finished wardrobe system, it looks amazing and everybody comments on how good it looks! It took a couple of hours to fully build up and it all fit together perfectly. Thank you again for your help in creating it, I would have had no idea where to start in doing it all by myself. Like this idea? DioMet can help you to create a similar design that fits your own measurements and design criteria or see here for some standard pricing in our webshop.